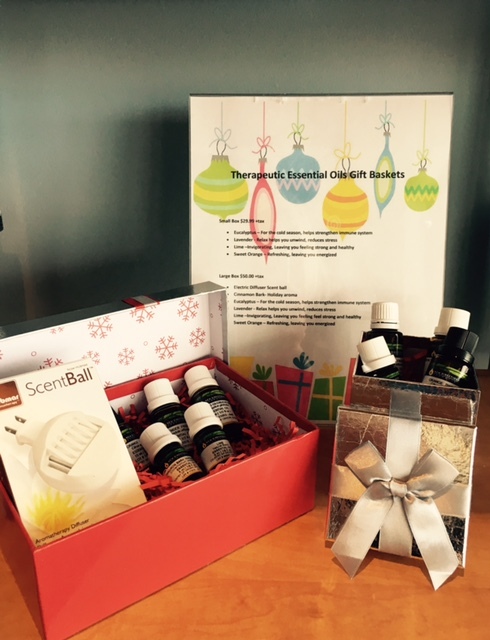 We have the perfect gift idea for family and friends with our Essential Oil Gift Baskets! For the Christmas season we have put together some of our teams favorite essential oils to share with you. Eucalyptus- For the cold season, helps strengthen immune system and fight bacterial or viral infections. Lavender- Relaxing and helps you unwind, sleep or reduce stress. Lime- Invigorating, leaving you feeling strong and bright. Sweet Orange- Refreshing and energizing to your senses. We also carry a variety of therapeutic needs great for stocking stuffers. Yoga tune balls, Biofreeze gel, and much more! Visit us at 2034 St.Joseph Blvd, Orleans to pick up yours today. Limited quantity on gift baskets.